Don’t choose a random caterer out of the phone book, instead ask your friends and family members for references. When it comes to caterers references are golden. If you aren’t able to get a reference from people you trust, think about events you’ve been to that impressed you and why you were impressed. If you come away with more than 3 caterers you’d like to speak with that’s fine, you can narrow it down to your top 3 choices later. 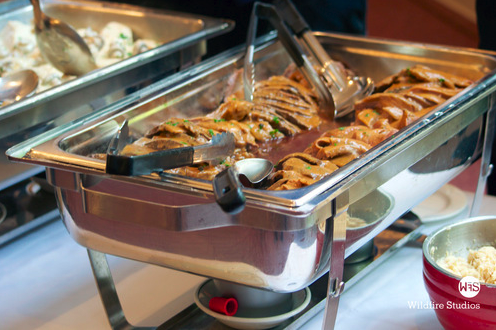 If you are ready to begin your search for a caterer, we have a list of questions for you to ask that will help you find the right caterer for you. 1) Ask the caterer if they’re available for your event date. If they are, follow up by asking if you can visit an event that they are catering so you can see their work first hand. 2) Ask for licenses, credentials and references, then check them to make sure you’re happy with what you see and hear. Afterward you should narrow down your choices to 3 catering companies. 3) Find out how involved the caterer is. You’ll want to know who is in charge on the day of your event. Also ask about rentals if needed and if you haven’t already found an event space ask for a referral from the caterer. 4) Discuss your budget and head count with the caterers and what services they provide for your money. Ask about staffing, linens, table settings, and their suggestions for your wedding menu. 5) Once you’ve agreed on a menu ask for a sample tasting of the menu. Once you’ve tasted the menu from each of the three caterers, choose the caterer who you feel most comfortable with and the meal you most enjoyed. Never choose a caterer just because an article said they were amazing, or because someone close to you said a certain company was the best. Alway trust your own instincts, you need to work with your caterer to ensure you’re getting everything you want and are comfortable asking them to make changes. Remember you want to get the most for your money, so don’t settle for less than satisfaction!